When I found out I was pregnant, my goal in terms of maternity clothing was to buy enough that I would be comfortable, but to really try to limit my spending. 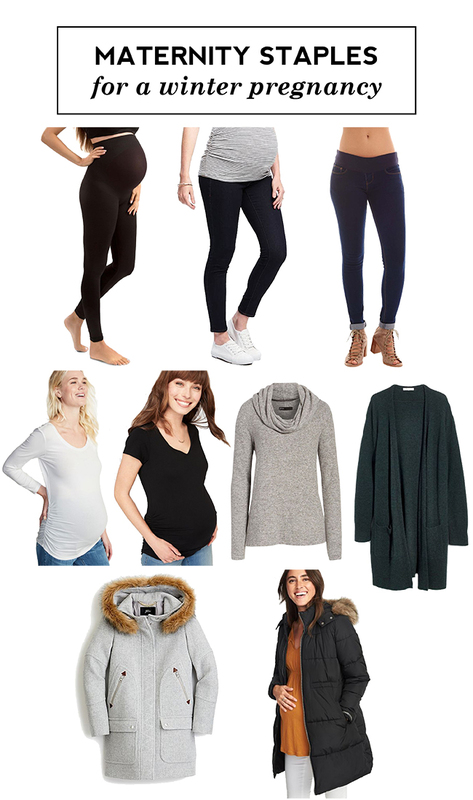 Being pregnant in the winter is really different than the summer, as I was able to keep a lot of sweaters in rotation and layer up to change up what I'm wearing every day. I think I actually only managed to buy two actual maternity tops and at 38 weeks am still doing fine, so that's a win for me! So what have my staples been? Old Navy Maternity Tees - I love these tee shirts, as they are really inexpensive and are flattering. I ended up buying four staple tees in black and white with short sleeve and long sleeve options, as well as a striped tee to mix things up a little. I initially thought I wouldn't buy the ruched style of maternity tee since they aren't really something you can wear post-pregnancy. But, once I hit around month six I started wanting to show off the bump more (and make sure people really knew I was pregnant!) and the side ruching is really flattering and lets you still have a waist along with your baby bump. 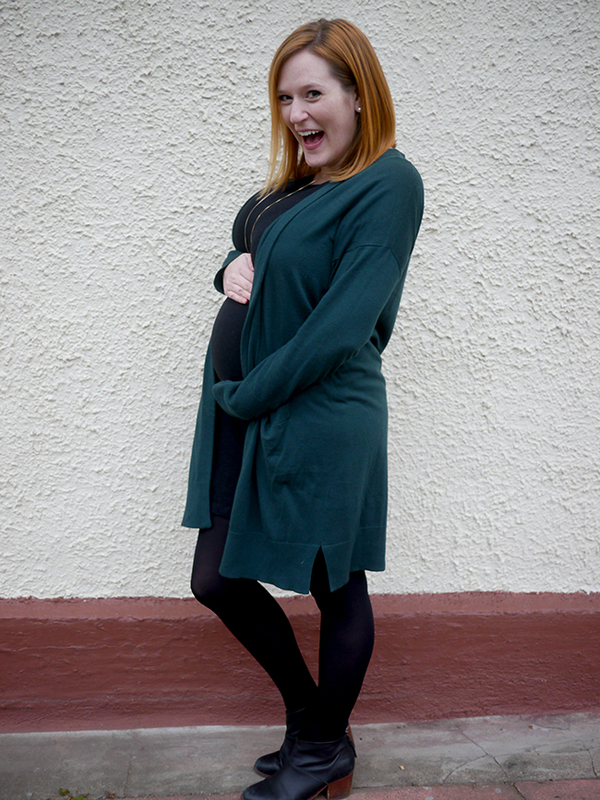 Non-Maternity Tunics - Even now, at 38 weeks, my tunic length non-maternity tops and sweaters are still pulling their weight! My favorite is definitely this convertible tunic sweater, which in theory you could wear off-the-shoulder but I never have. The length is still great on me, and it's so versatile it can work for a date, a night out, work, or the weekend. Oh, plus it's amazingly soft like pajamas so I want to wear it all the time. 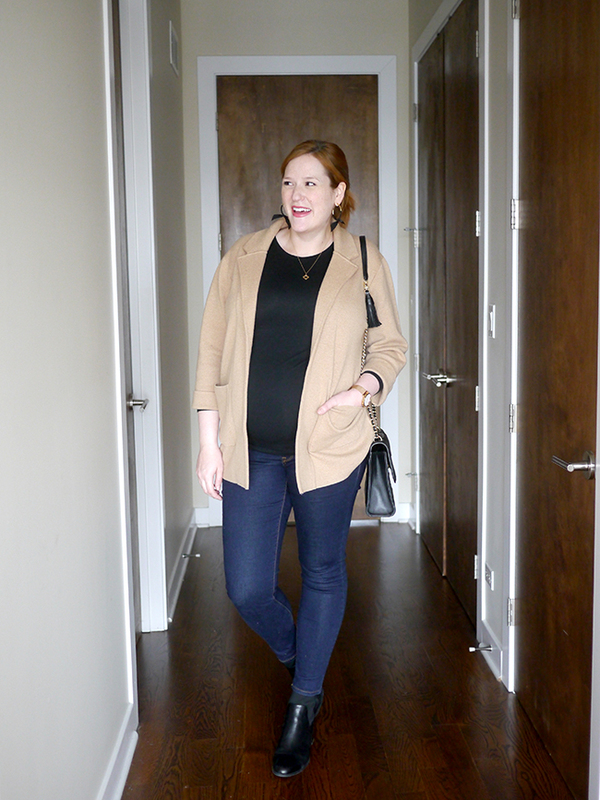 Non-Maternity Cardigans - In case you haven't been able to tell from my increasingly less varied style posts, I've been wearing cardigans almost every day for the past few months. Some of my favorites are from Old Navy, Madewell, Nordstrom, and this one I snagged from Target last month. Amazon Maternity Dress - I needed something dressy to wear for my baby showers and a couple of holiday events, and am so glad I found this maternity dress! It was really inexpensive, flattering, and thanks to the color and cut worked layered under so many things to give me a different look every time I wore it. Old Navy Premium Maternity Jeans - As someone who has always carried more weight in my midsection, I was ready to dive into the world of maternity jeans right away! I mean, really, I may never go back haha ;) These full-panel jeans didn't quite fit at the beginning of my pregnancy but all the sudden in month eight they started staying up on my bump and getting really comfortable. I love that they have the band start under the regular waistband of the jeans, which makes them look a lot more normal. I did forget about how big sizing runs at Old Navy, so if you're looking for maternity jeans for the beginning of your pregnancy definitely size down! I tried a ton of brands for maternity jeans, and these were the only that came in a long enough length for me but didn't have a crazy high inseam. Everly Gray Maternity Jeans - I loved these at the beginning of my pregnancy, as they had a full stretchy waistband at the top that was really comfortable, but didn't have any issues staying up while my bump was still small (read: non-existent). Blanqi Leggings - I tried (and returned) a lot of maternity leggings, going from lower-end at Amazon and Target up to hundred dollar plus Spanx leggings, and these ended up being my favorites. They are opaque, they stay up no problem (when my bump was small too) and they are long enough for my very long legs. But, are they the perfect maternity legging? Definitely no, as they pill really easily. The instructions say to be careful about how you wash them to avoid pilling, but mine have pilled before they even make it to the wash. I've been through a few pairs, and currently have my nice, rarely worn still-look-like-new pair as well as a couple pairs that are really pilled that I wear around the house or only with longer tops and sweaters. Old Navy Maternity Coat (sold out) - I initially wondered what other people did for coats in the winter - it seemed so wasteful to buy something new that I would only ever wear for a couple of months. 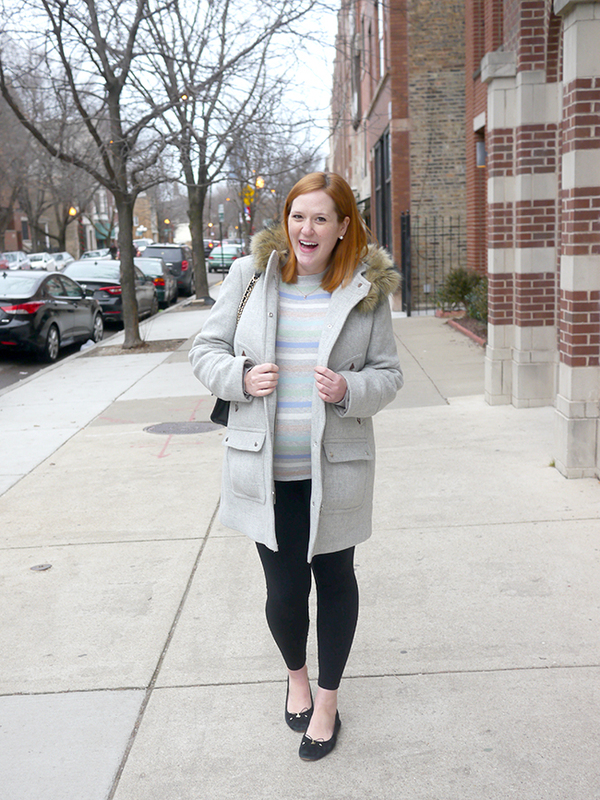 It sounds like some people wear their husbands coats or try to get by with their regular coats, but in Chicago (with some serious winter weather this year!) that was not going to cut it. I ended up deciding to look for something inexpensive that would work well enough to get me through. I was pleasantly surprised by a puffer I snagged from Old Navy (which is sadly now sold out - noooo!). It's lined in fleece so it's really warm, and it has an adjustable tab at the waist so you don't end up looking like a total marshmallow. Definitely size down in this also, the first one I ordered was gigantic. J.Crew Chateau Parka - This is my regular "nice" winter coat, and I'm amazed that at 38 weeks the swingy cut still fits over the bump! I know some people can manage through a whole winter in this weight of coat, but for me it isn't quite warm enough for commuting via public transit - I only reach for it if the temperature is going to be above freezing.